How one can become member? It is also with great pleasure that we announce that Malta Health Network has been accepted as a full member of the International Alliance of Patients’ Organisations (IAPO). This is the first affiliation of MHN on an International level. MHN is grateful to the Civil Society Funds which make it possible to maintain membership in these important organsations. MHN received the reimbursement for membership fees paid for 2014 by the Minister for Social Dialogue, Consumer Affairs and Civil Liberties Hon Helena Dalli during a ceremony held for this purpose together with other representatives of Civil Society. These funds will cover part of the membership fees paid to European Patients Forum (EPF), European Public Health Alliance (EPHA) and Volonteurope. These are essential to keep our communication and receive information on a European Level. We were delighted to host the 23rd Annual Volonteurope Conference in Valletta, Malta (12-14 November 2014). The event, entitled ‘Enlargement, Migration and Social Cohesion in the EU’ was be held under the distinguished patronage of H.E. Marie-Louise Coleiro Preca, President of Malta. This year’s Conference looked at the importance of European Civil Society on the 10th anniversary of the biggest recent enlargement of the European Union, as well as the trends, challenges and positive developments associated with mobility and migration in Europe – both intra-EU, as well as from outside of the Union. The event, brought together 140 participants from across Europe, which included keynote addresses from H.E. President of Malta, European Commission officials, Maltese politicians engaged in enlargement and migration processes, leading Maltese human rights lawyers and activists, as well as Presidents of leading European civil society networks. 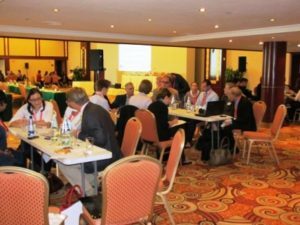 Roundtables were led by consortia made up of NGOs, inter-governmental organisations and institutions from across Europe. The 23rd Annual Volonteurope Conference was also the occasion where the ceremony of the 8th Active Citizens of Europe Awards, hosted by H.E. President of Malta at Valletta Palace of Grand Masters were announced. The launch was held on the 30th at The Palace Hotel, Sliema. 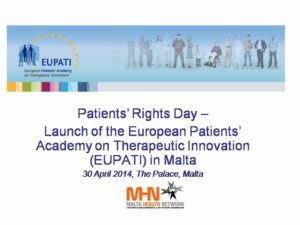 The European Patients’ Academy is a 5 year project funded by the Innovative Medicines Initiative (IMI), a joint undertaking of the European commission and EFPIA. The consortium is led by the European Patients’ Forum (EPF) and made up of several European patient organizations, academic institutions, not-for-profit organizations and pharmaceutical companies. EUPATI aims to make a substantial and measurable difference to patients, providing the tools and the knowledge for their empowerment and meaningful involvement in pharmaceutical innovation, safety of medicines and access to treatments. It aims to inform the general as well as the more hard-to-reach patient community, raising public awareness of the development of new treatments. In order to successfully implement EUPATI Project across Europe, in each participating country an EUPATI National Liaison team (NLT) has been created. disseminate information about EUPATI education material, newsletters into their country and to raise public interest about EUPATI o encourage greater national patient involvement in medicines research and development. The Maltese EUPATI NLT is chaired by Gertrude Buttigieg (Malta Health Network) while Prof. Pierre Mallia (University of Malta) represents the Academia and Ms Margot Pisani (PRIMA) represents pharmaceutical industry. 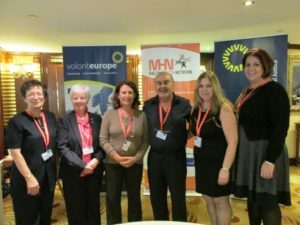 In view of the upcoming EU Parliament Elections – the Malta Health Network in Collaboration with the European Parliament Office – Malta organised an information session and discussion between Health Organisations and MEP candidates. Event was well attended by the general public and MEP candidates who were very interested to hear to views presented during the meeting. 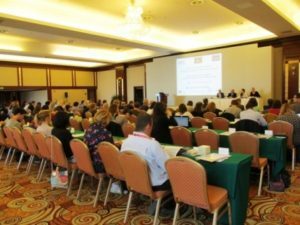 The Malta Health Network (MHN) promotes the health-related interests of patients and the wider community by updating itself about international ‘best practices’ and ‘capacity-building’. The MHN achieves this through its regular contacts with local and international health-related Governmental Organisations, Non-Governmental Organisations, ‘Not-for-Profit’ Organisations and Patient Representative Groups.